Not that it's a lot, but nowadays HDMI is most common, and there are four of them here. If you happen to have four hundred euros you don't need, you can spend it on the above-mentioned One Connect Box. 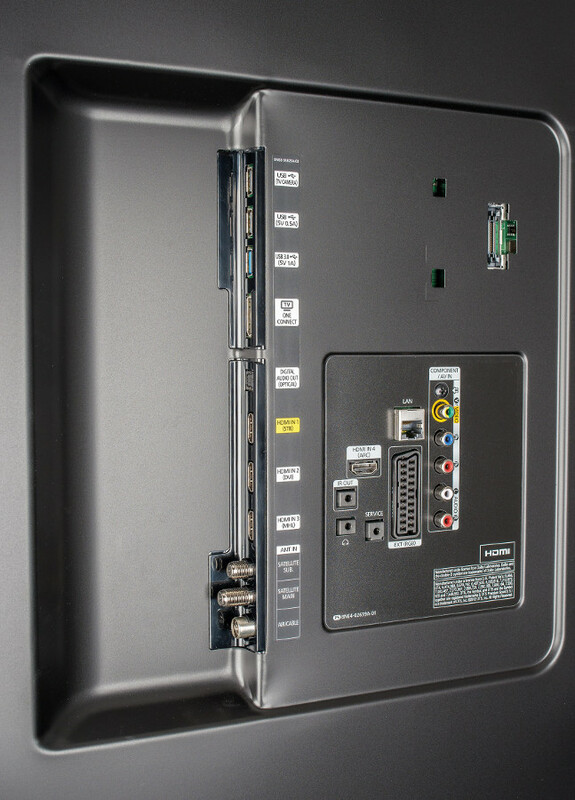 In this case all the devices can be connected via the box, which in turn connected to the TV with a single cable (more on this in the next part, Accesories). Of all these AV inputs I only used HDMI. This device doesn't support the new HDMI with Ethernet standard, so you'll have to hook it up to Ethernet (100 Mbps) with a separate cable. On the good side, it does have support for Anynet+ (also known as HDMI-CEC), which is a protocol allowing controlling other devices via HDMI. The TV has two analogue and two digital tuners (! ), but I couldn't make use of any of these. 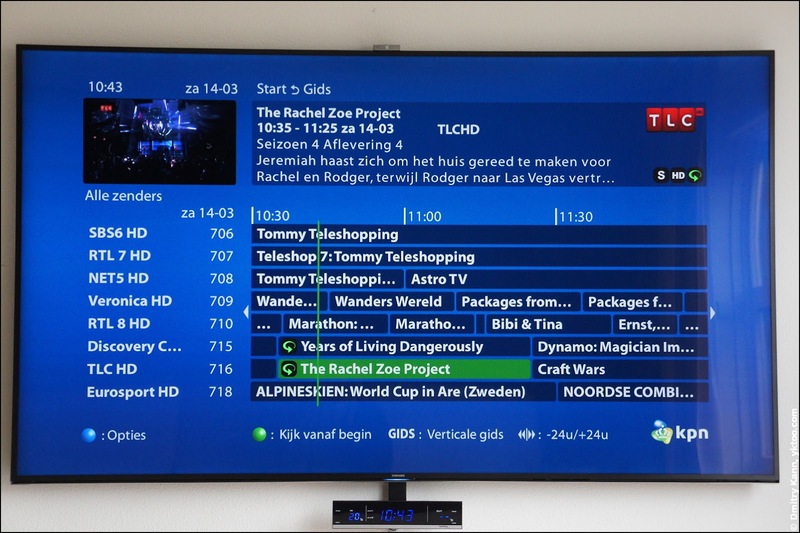 Analogue terrestrial television is long time gone here in Holland, although some providers are still delivering it through the cable. There is digital terrestrial television (DVB-T), but it's only three state channels and a few regional ones. They are all available in my cable subscription in a better quality (full HD). There is also a satellite decoder, and the TV even supports dish positioning systems DiSEqC 1.2 and USALS. This TV is shipped with a pair of remotes, a conventional one and an innovative Smart Touch Control, which looks very much like a soap bar. Remotes shipped with the TV. 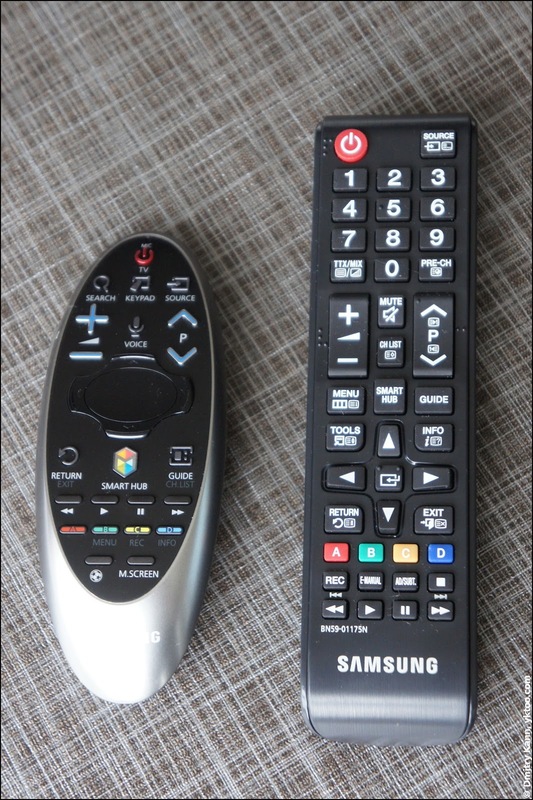 The conventional remote needs no additional explanation, it uses regular infrared (IR) transmission to send commands to the TV. The "soap bar" is a more peculiar piece of technology. It only uses IR to send on/off commands, and all the rest is transmitted via Bluetooth. The connection goes into standby after a minute of inactivity, which in turn causes some reconnection delay when you hit a button, a second or two. You move the spot by tilting the remote, which has gyroscopes to track its orientation. To "click" the mouse you just press the button. And if you lift your finger off the button, the spot disappears. This is quite a handy feature, and well implemented. As mentioned above, the button is also a touchpad that allows horizontal and vertical scrolling, for example, in the web browser. But I found this function quite difficult to use, since the touchpad was always either over- or irresponsive. More to follow. 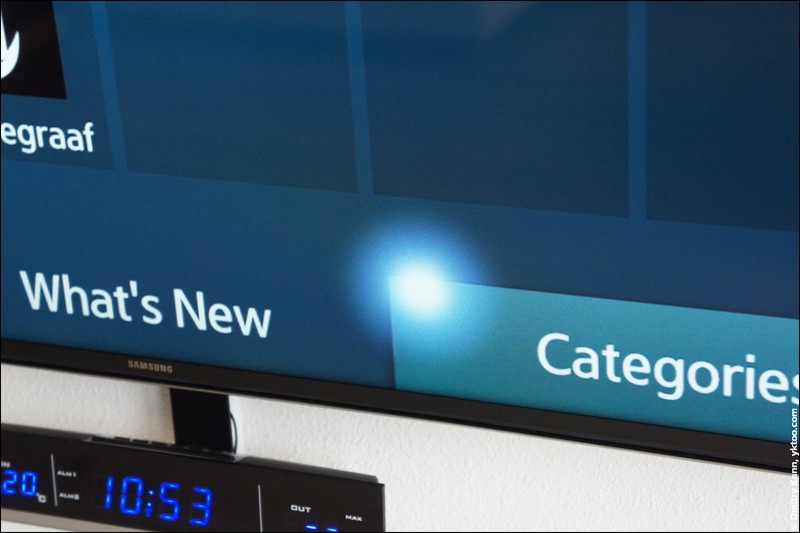 The Voice button lowers the TV volume and enters voice control mode. The remote has a microphone near its tip, where you say the commands. The voice system supports dozens of commands, from controlling volume to ordering films, but the implementation was quite disappointing. 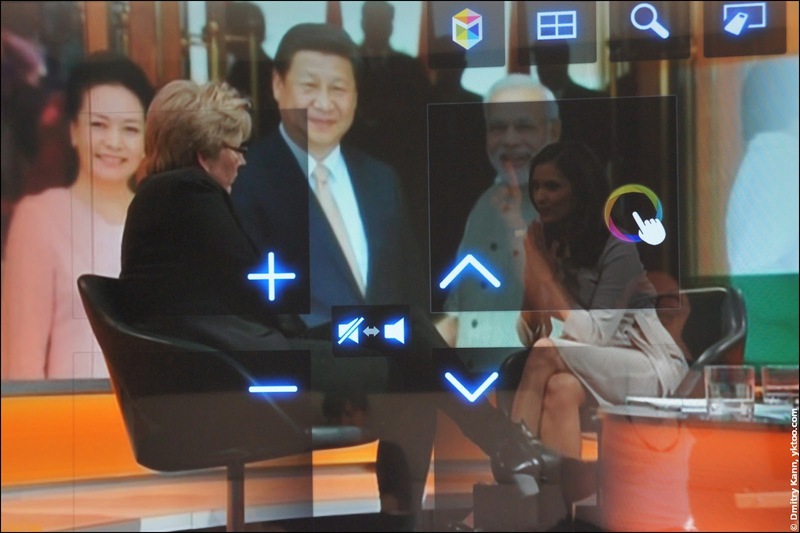 Maybe it's me, but the TV refused to recognise most of my commands, often misinterpreting them in an inexplicable way. In addition to the two remote controls, you can connect a regular keyboard and/or mouse over either USB or Bluetooth. 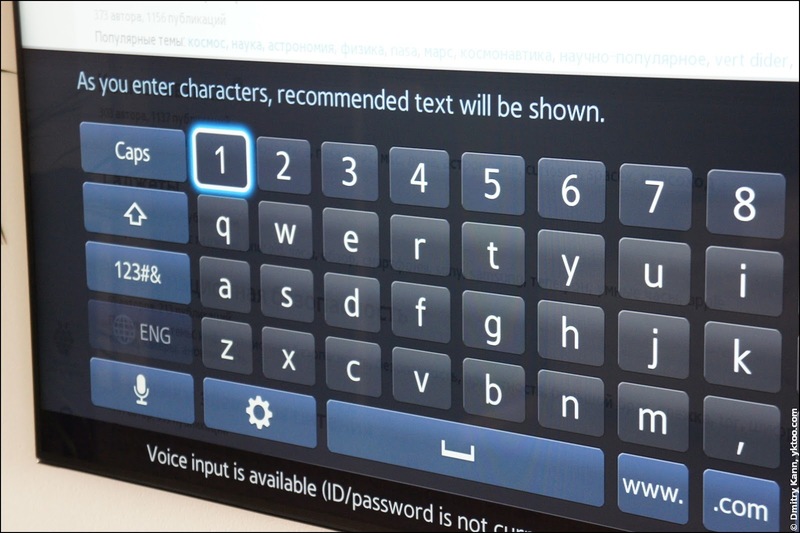 In the case of a keyboard, its functional buttons are used for TV-specific commands (for instance, F6 = Source, F7 = channel list, F8 = Mute etc.). For this to work you have to be 1.5 to 5 m away from the screen, and well visible. So it won't work in the darkness, for example. Also the convenience of this way of controlling the TV is questionable in my opinion. It's just way faster to grab a remote and push a button. Invoking TV guide from TV's remote. Of course, this screen doesn't support the mouse mode (the STB knows nothing of it), so you'll have to use the arrow buttons. But it's still quite handy and works well.